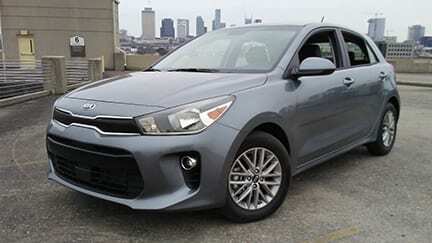 If you’re in the market for a brand new car that’s under $20k, then it’s time to say hello to the 2018 Kia Rio (5-door LX). This new Rio is completely redesigned with refreshingly bold style that’s not only smart in style but also has a really cool sporty package. The 2018 model is built lower and longer, with wider proportions that gives it a rather athletic look. It’s truly a next-generation style vehicle. The 2018 Rio 5-Door offers a cabin full of amenities in all the right places where it counts the most. Like the redesigned center console with additional storage room, and the modern floating display that fits a larger screen while preserving the interior’s clean lines and airy flow. The interior features are designed to make both the driver and passengers feel safe and stylish. From the ergonomically arranged controls to the 6-way adjustable driver’s seat. The Rio 5-Door’s spacious cabin, with quality seating materials and comfort-focused features, makes every drive feel like a getaway. The Rio 5-Door’s front end seamlessly integrates multi-reflector halogen headlights with the Kia’s signature tiger-nose grille. The power-operated side-view mirrors conveniently heat up to help melt ice or snow. The rear window is heated to help defrost or melt snow for a clear view. And with a convenient, automated shut-off system, you don’t have to worry about overheating.